Great final, it had everything; terrific comebacks, controversial disallowed goal, red card, drama right to the end! Great work Steve getting the video up so soon, I was able to watch and enjoy the game before I knew the result. WTF happened with those two non-goals? Has anyone seen that before? 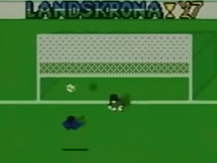 I thought with the first one it was the half-time whistle, but no, "Goal Kick ()" appeared before "Half time". Normally if the ball goes over or wide, we see how high or how wide the ball was. This was very odd indeed! I shall perform forensic analysis on the available evidence and try to find out why the goal wasn't given.